As promised in the last post, this time, I’m posting about one of my bean stalks (the yard long beans). 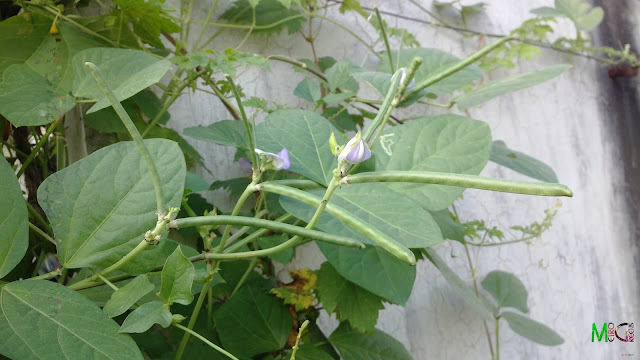 Though, as per its name suggests, these beans aren’t a yard long, and the ones on my plant are even smaller, around 8-10 cms, a bit smaller and darker in colour compared to the ones sold in the market. 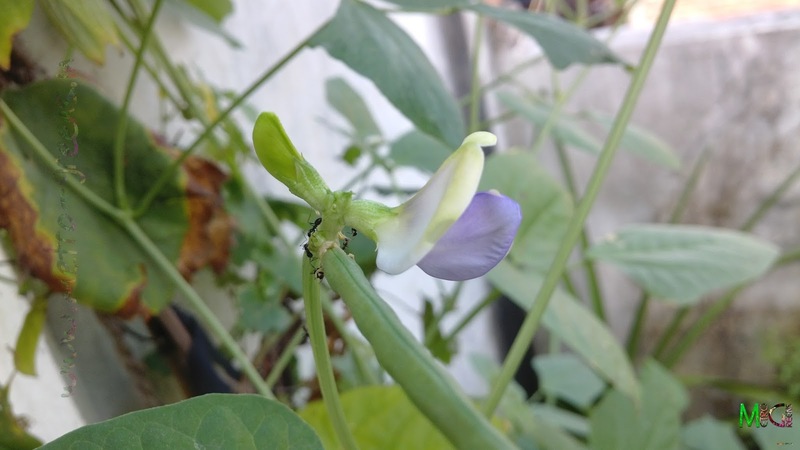 Beans in the beanstalk with a flower too. I don't know what these ants are doing on the plant, but they are everywhere on this plant. I have no problem with them until they do any harm to my plants. Beans in the beanstalk. In this shot, you can see my grapevine as well as my bitter gourd vine too. 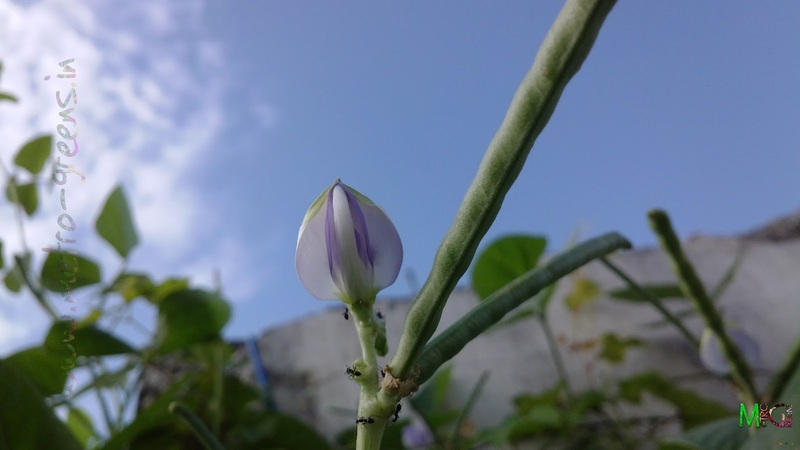 Around a couple of months back, my mother sowed two seeds of this bean, out of those two seeds, only one germinated and had a chance to grow enough to become a full fledged beanstalk. 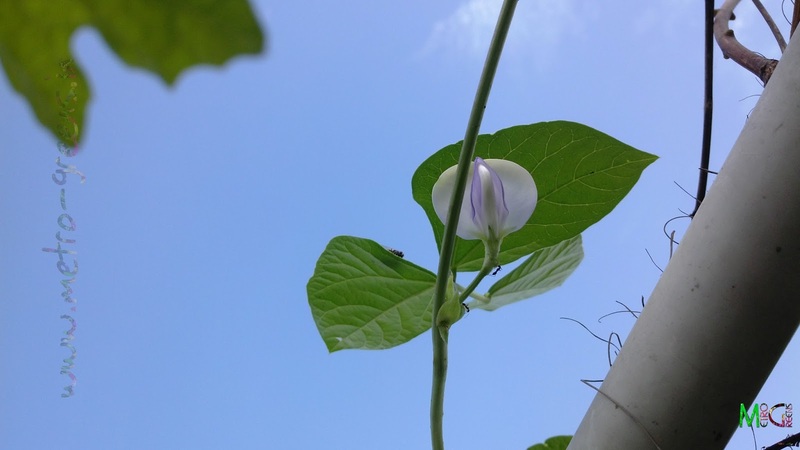 For around a week, this beanstalk is blooming and long and thin beans appear the very next day. 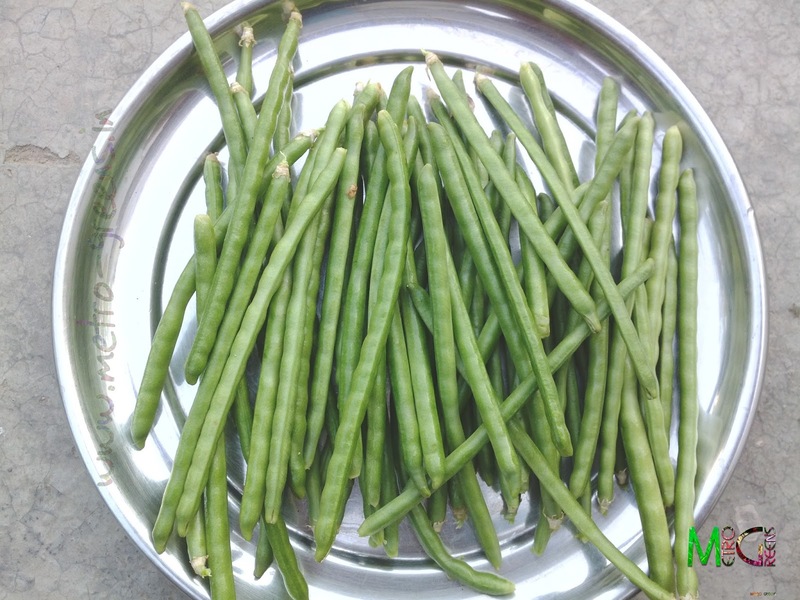 And in just the next two days, these thin and long beans develop enough to be harvested; else the fruits will develop seeds, rendering the beans not very usable for making vegetable out of these beans. The best part of this variety is not a single flower goes waste. Every flower that is blooming bears a fruit. I have seen this in almost all flowers over the last week or so. I haven’t seen such a productive plant before, where all the flowers blooming will bear a fruit. Earlier, I saw big inflorescences of my black grapevine, but that too had a flower to fruit ratio of around 25-30 percent, this means that for every 100 flowers that bloomed, only 25-30 were able to become a fruit. A pretty watchable bloom of the beanstalk. 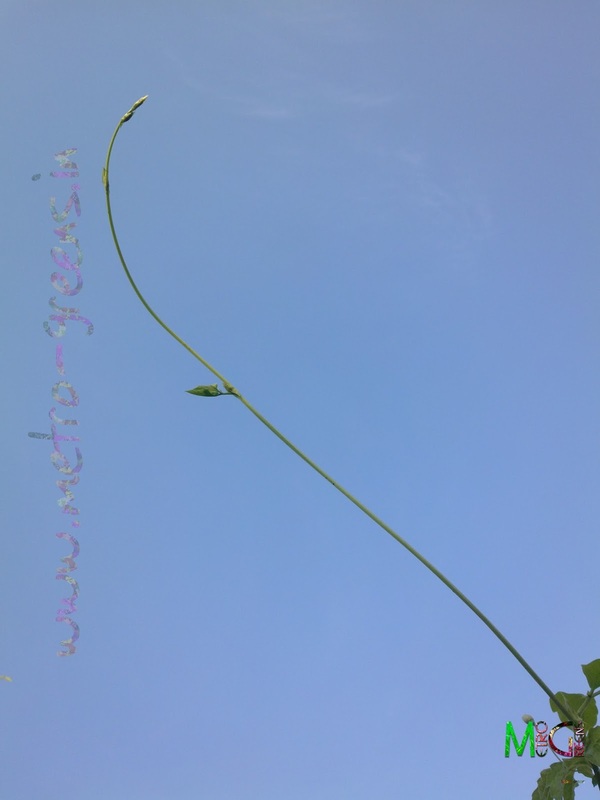 Another watchable bloom of the beanstalk, with an adjoining bean too. Here are some nutritional facts about the yard long beans along with links to the source of this data. A part of a day's harvest. some freshly harvested yardlong beans. 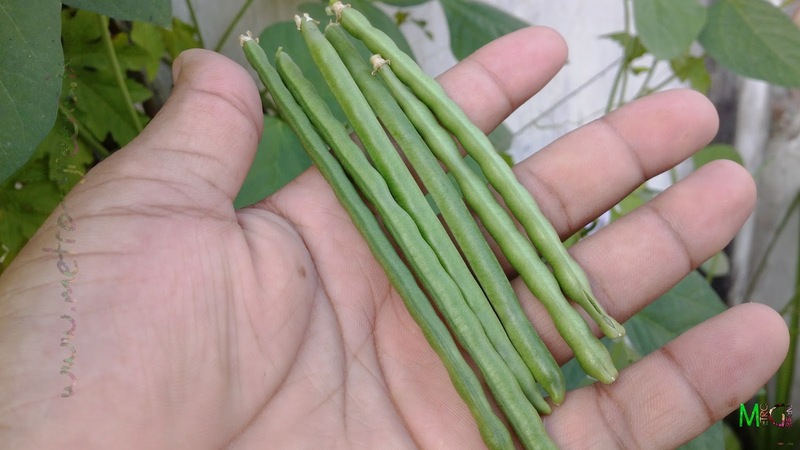 Everyday, I get to harvest a handful of these beans, because if I don’t the beans won’t be very good to eat, and since I have only one plant, I get this much only, so, collecting the beans and storing in the refrigerator for a couple of days to collect a substantial amount to be had as a vegetable is the only choice left with me. In the last five to six days, I have collected enough beans to relish for a one time meal for our family of four. More than that, I am getting some home-grown organic fresh beans without using any chemical fertilizers or pesticides. I think this is more than enough of my beanstalk adventure. I’ll be back with something else from my garden chronicles to share with you guys in the next post. Till then, keep visiting and HAPPY GARDENING! And I love these on the vine only. :) Thanks for visiting and your comments Anunoy!